Jack Kirby created a great character in Mister Miracle, and like most Kirby creations, other artists have been able to put their own spin on them. Marshall Rogers did a short but great Mister Miracle run that started in 1977. This DC house ad announced that Mister Miracle was starting up again. Although Rogers has a wildly different style from Kirby, he captured the dynamic fun behind the character. The costume retains Kirby's design and the way he flies on the aero-discs is wild. Rogers put some thought into how a hero would balance himself on those things. You've got Barda standing there in her Kirby bikini, with Oberon looking on--disdainfully or ornery? It blew me away that Steve Englehart and Marshall Rogers were behind this revival. Englehart was one of my favorite Marvel writers and his Detective Comics with Rogers was underway. I already knew the Englehart/Rogers team was magic and on par with Lee/Kirby, Thomas/Smith, Claremont/Byrne, etc. I was amazed that Rogers could produce 2 books per month! 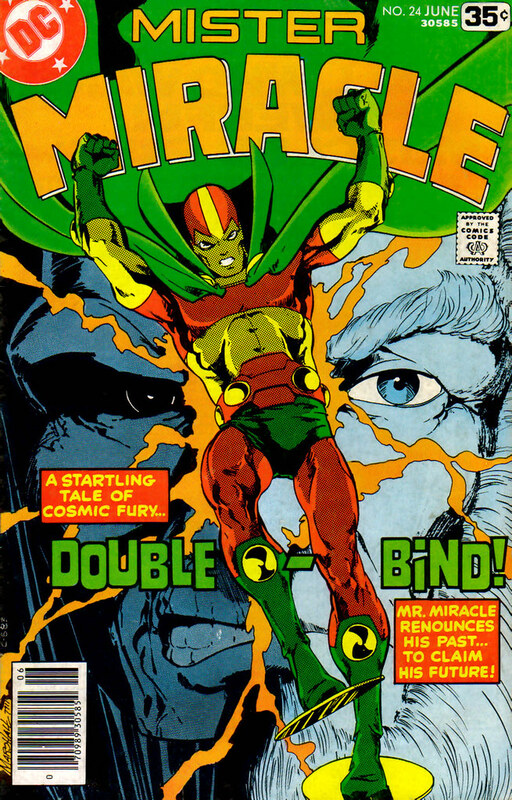 I believe Mr Miracle was bi-monthly and Detective was less than 12 times per year, so that may explain it. Mister Miracle 19 was the start of the new run. Kirby's last issue, number 18, was published in 1974. Only 3 years had passed before DC had tried to revive the character. 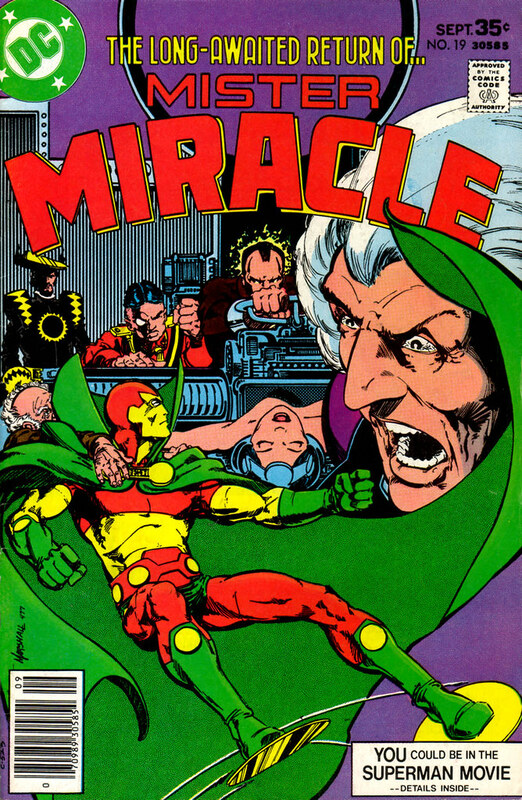 This cover is not only good for a re-launch, it is fairly iconic, because it has Mister Miracle facing off against the evil war-mama of Apokolips, Granny Goodness. Talk about domineering mother-figures, Granny subjected Scott Free to all kinds of torture as a child. Naturally she returned to bedevil both Scott and Big Barda in this issue. Englehart's stories had some elements that Kirby purists detested, such as the scene where Scott divests himself of Mother Box. He felt that Scott Free was too dependent on the device and would be more heroic if saved himself without any aid. Mother Box is one of those inventions that miraculously came true later, if you equate the Source to the Internet and our iPhones, iPods, mobile devices to Mother Box. I can't live without mine and after this run ended, Scott Free went back to his Mother Box as well. 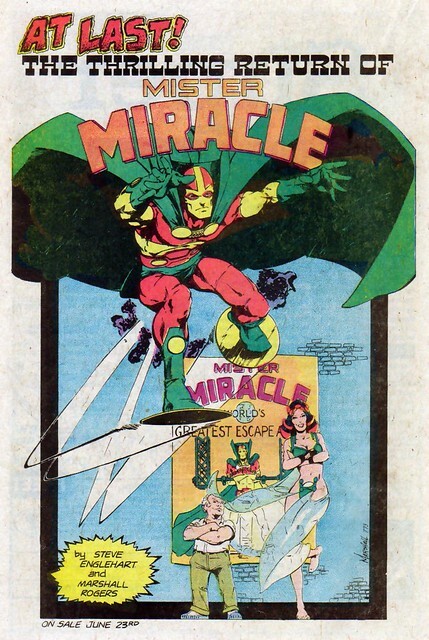 Englehart didn't last long on Mister Miracle. His last issue depends on whether you count his nom de plume John Harkness, which appeared on the credits for Mister Miracle 22. Rogers left the series as penciller with that issue, but stayed on as cover artist for a while. The cover to Mister Miracle #24 is another one that captures something important about Scott Free. He is the child of two worlds, born on New Genesis, raised in Apokolips, often used as a chess piece in the war between Darkseid and Highfather. But the World's Greatest Escape Artist can escape almost any trap, except one: cancellation! 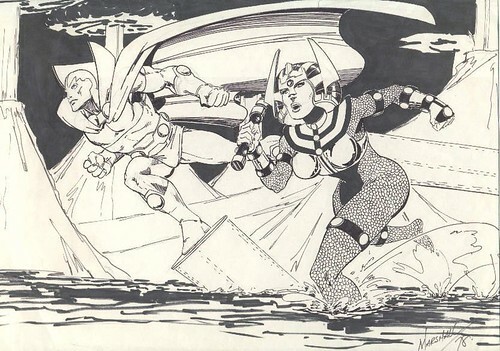 I recently discovered this cool Mister Miracle and Big Barda drawing that Marshall Rogers did in 1978, showing DC's greatest married couple racing through the volcanoes of Apokolips. Rogers did wonders with Big Barda's costume and Kirby headgear. Nuff Said! Link: John Cogan Gallery at ComicArtFans. Wow that Source/Internet comment floored me. I have never once thought of it that way, but yeah I guess you are right. Wow. I love Mister Miracle! You ever seen that episode of Justice League Unlimited where Scott and Barda team up with Wally on a rescue mission? Great stuff. And his costume is just crazy enough to work. Great art!